Collect a 40% bonus on top of your football bets with William Hill ACCA Insurance! Place a football bet with 6 or more accumulators to get 40% on top of your winnings with the awesome William Hill ACCA Insurance. If the bet doesn’t work out, then the online sportsbook will refund your wager with a Free Bet up to £50/€50. This way, you won’t lose anything by placing a wager with the William Hill ACCA Insurance. The following markets apply for the football accumulator bonus: Match Betting (90 minutes – Home, Draw or Away), Both Teams to Score and match Result & Both Teams to Score. It’s important to know that this offer only applies to customers from the UK, Ireland and the Channel Islands. If you come from another territory, don’t worry! Because the online sportsbook has plenty of other offers you can use on many different markets! All of the major football leagues in Europe have only 1 or 2 more rounds to go until the end, so this is your chance to maximize your bets. William Hill ACCA Insurance ensures you get an extra bonus depending on the number of folds you’ve placed with the accumulator. 6-8 folds will see you get a 10% bonus, while a 9-11 or 12-14 folds will reward you with 15% and 20% bonuses respectively. The percentages increase with the number of folds, with the biggest bonus being 40% for 24+ folds. The last round of the Premier League will be played this weekend, making this the perfect opportunity to make a killing with the William Hill ACCA Insurance before the season is out. Arsenal play Aston Villa at the Emirates, while Chelsea will go head to head with Premier League champions Leicester City at home as well. Tottenham will face Newcastle away and Swansea will receive a visit from Manchester City. 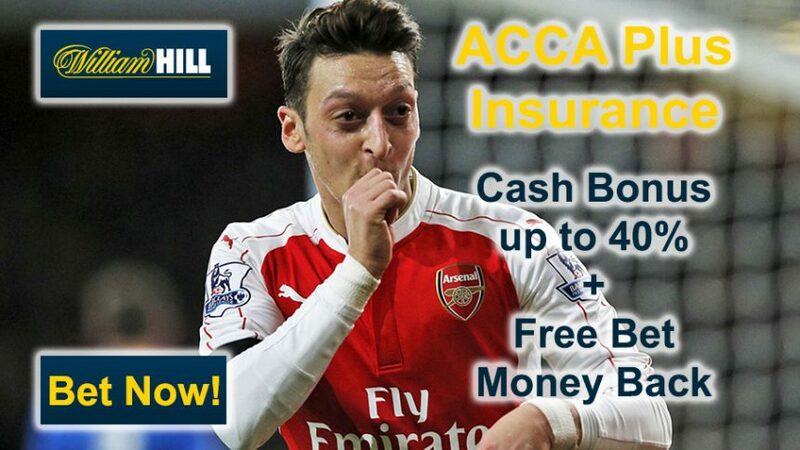 Join the online sportsbook today to get the 40% bonus with William Hill ACCA Insurance! Collect a 40% bonus on your accumulators with William Hill ACCA Insurance!